Flower of the East. That was the name the Italians gave to this green place of azure seas and hidden beaches. Because of the mild, wet winters, Zakynthos has a lot more vegetation than many other Greek islands. Situated 65 km southwest of Patras, off the western shore of the Peloponnesian peninsula, the name "Zakynthos," as any place name in Greece ending in "-thos," is very old. The island is also called by its Italian name, "Zante." The international airport at Zakynthos receives flights from many northern European and transatlantic destinations, making it a major tourist island. The aquamarine of the Ionian Sea is crystal clear, and the island has a lively night life. The ferry from the mainland, at Kyllini, a half-hour drive southwest of Patras, takes about an hour. 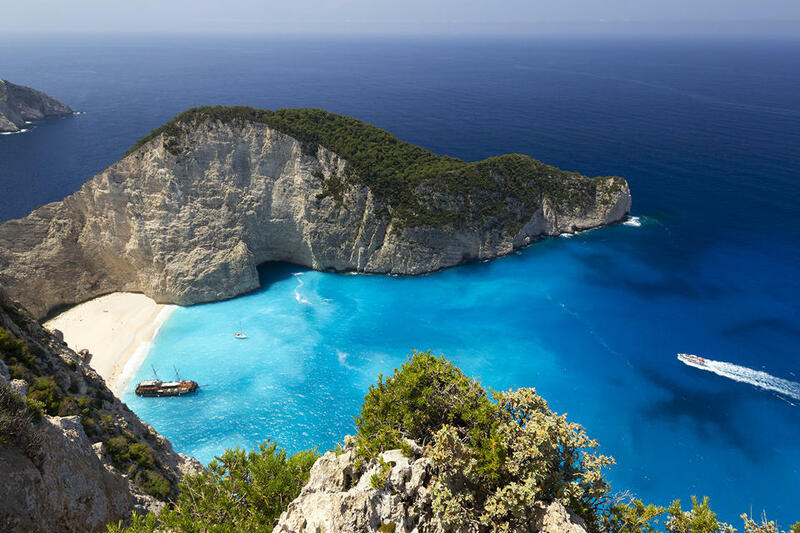 The best-known site in Zakynthos is Navagio (shipwreck) beach. Zakynthos is the home of Greece's national poet, Dionysios Solomos, who wrote the Greek national anthem on a hill above Zakynthos Town. Solomos was the illegitimate child of a Greek Cretan count who had fled the Ottomans in Crete and re-settled in Zakynthos, and his housekeeper. His poetry was virtually unknown until after his death. Geographically, and culturally this arrowhead-shaped island, oriented NW-SE, can be split 3 ways: on the south and east coasts you'll find all the tourist stuff, its south-central, raletively flat, agricultural section, and the uplands in the center-north. Archeologists claim that Zakynthos has been inhabited since the Late Stone Age (around 5,000 BC). Homer says that the name comes from one Zakynthos, the son of Trojan King Dardanos, who arrived around 1500 BC. The Venetians, who occupied the island for hundreds of years during the Middle Ages, called it "Zante," and "Fioro di Levante," or "Flower of the East." Mythology states that King Arkesios of Kefalonia, a son of Zeus, and grandfather of Odysseus conquered the island. Sometime later, Odysseus took over. 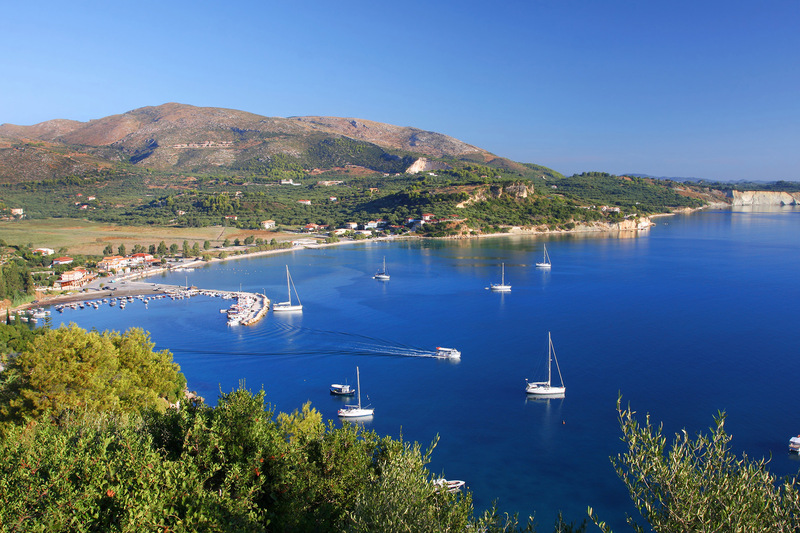 Artemis, goddess of the hunt, and Apollo, the sky god, are said to have been fond of Zakynthos. Artemis would hunt the island's forests, and Apollo would play his lyre, singing its beauties and charms. 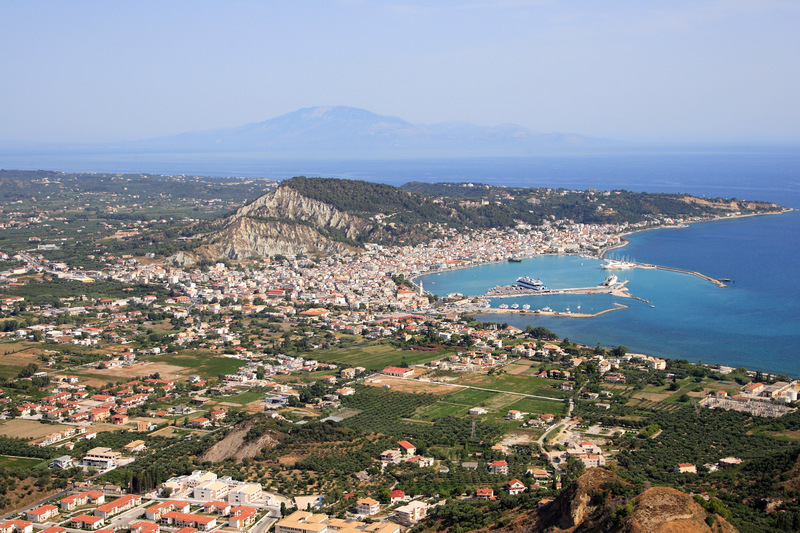 Zakynthos, which at the time was ruled by neighboring Ithaca, home of Odysseus, took part in the Trojan War. When Odysseus returned from Troy he killed his wife's many suitors, 20 of which were from Zakynthos, after which the island was given its independence from Ithaca, ushering in a 650-year period of democracy, the first and most long-lived period of self-government in Greek history. Zakynthos opted out of the Persian Wars (499-449 BC) until 479, joining the Allied Greeks at the battle of Platalea, the final battle of the 2nd Persian invasion which repelled the Persians and kept them in their own back yard for the remaining 30 years of the conflict, which were characterized by Greek aggression against Persia in Thrace, in the Aegean Islands, in Cyprus, and in Egypt. The Zakynthians allied with Athens against Sparta. Macedonia occupied the island in the mid 300's BC. The Romans were next. The Romans, perhaps mindful of the long history on Zakynthos of democratic governance, allowed, after the first few years of direct Roman rule, the Zakynthians to run their own affairs. They had their own legislature and their own currency. By the 3rd century, AD, Zakynthos had adopted Christianity, and submitted to the authority of the Byzantine Empire in Constantinople. During the first millennium Zakynthian society was extremely poor, and stratified into working, merchant, and noble classes. Pirate raids were a constant problem, as they were in all of the Greek islands. In fact, throughout the Christian era the Greek islands had pirate problems. They were historically poorly administered because there were so many of them, and whatever occupying force happened to be running things never had the military resources to keep them all safe from pirates, so it was a constant game of whack-a-mole for any given occupying power. In 1185 the Kingdom of Naples took over. The Neapolitans ran things on Zakynthos for the next 300 years, until the island was transferred to Venetians in 1479, where they stayed until 1797. After short periods of rule by France and Ottoman Turkey, Zakynthos and the Ionians were ceded to the British in 1809, until 1864, when the Ionian islands were united with mainland Greece. In 1953 a 7.2 Richter earthquake centered off neighboring Kefalonia leveled about 70% of the island's buildings. The industrious Zakynthians rebuilt quickly enough to take part in the tourist boom which followed in the 60's. Zakynthos was home a number of nationally significant figures in the creative arts. Three giants in literature were the poets Dionysos Solomos, writer of the Greek National Anthem, and his contemporary Andreas Kalvos, and the novelist, Grigoris Xenopoulos. Zakynthos was also home to other accomplished men in the creative arts, such as 18th century painters Nikolaos Doxaras, Nikolaos Kandounis, and Nikolaos Koutouzis, and 19th century poet Georgios Tertsetis. For many centuries Zakynthos had a stable, fully-integrated Jewish community. Romaniote Jews of Zakynthos, had landed on the island some time after Rome had destroyed Jerusalem in 79 AD. Initially, Italy was in charge of the occupation of Zakynthos, but ceded control to the German Nazis after Rome fell to the Allies in September, 1943. Zakynthians traded the relatively benign rule of the Italians for the much harder and crueler rule of Nazi Germany. The island's civil and religious leaders, Mayor Loukas Karrer, and Bishop Chyrsostomos, were summoned to the headquarters of Kommandant Paul Berenz. They were ordered to provide a list of all Jews living on Zakynthos, and their assets, within 24 hours. The two men met with the island's rabbi, Moses Ganis. After a time of discussion and prayer, the mayor and the bishop conferred with one another. Then they said to Rabbi Ganis, "If they take you, we will walk with you. The mayor and the bishop decided to present the Kommandant with his list the following day. There is little doubt that the mayor and bishop did not sleep well that night. The following day they showed up at Kommandant Berenz's headquarters. They were shown into his office. After greeting him, they handed him a sealed envelope. "Here are your Jews," Mayor Karrer said. The mayor and the bishop stood silently as the Kommandant unsealed the envelope. They saw his eyes widen as he read the list. There were only two names on it: Mayor Loukas Karrer, and Bishop Chrysostomos. The rabbi, the bishop and the mayor took advantage of the time Berenz needed to get instructions from Berlin to warn the island's 275 Jews to hide in private homes scattered throughout the island, and to provided them with Orthodox Christian birth certificates. In one of the very, very few stories about Jews in WWII with a happy ending, not a single Jew was betrayed by their Greek hosts, and the entire Zakynthian Jewish community was preserved intact. Although many of the villages of Zakynthos suffered extensive damage during the 1953 earthquake, the rubble has long since been cleared, and they all have their unique charms and are worth a visit, plus there are those 30% of buildings which survived the quake. Generally speaking, the bigger resort and more tourist-focused areas of Zakynthos can be found on the southern half of the island, particularly on the SW coast. As you move further north and west, a more "authentic" Zakynthos is revealed, with traditional mountain villages virtually unchanged for centuries. 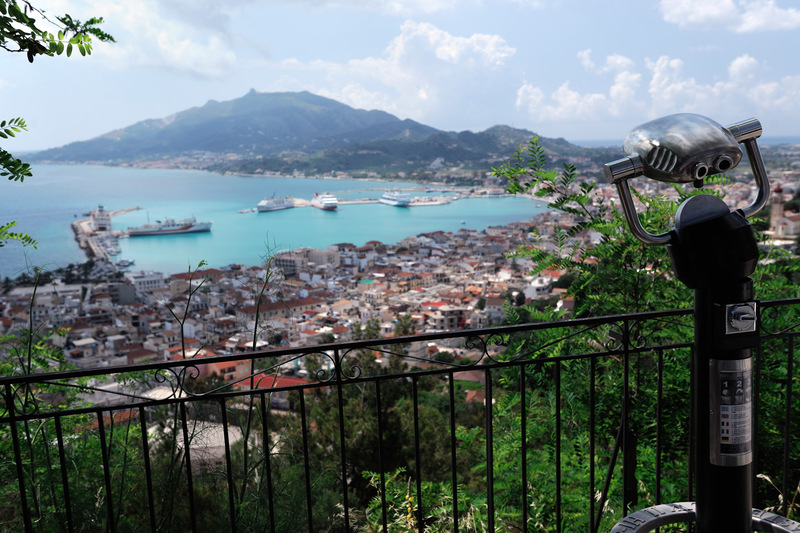 We'll start with the capital, Zakynthos Town, and then look at 10 others in alphabetical order. 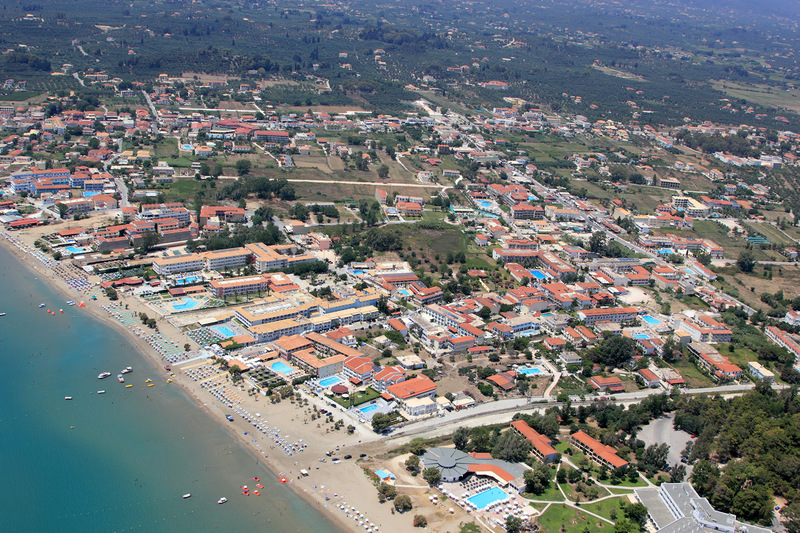 Zakinthos Town, commonly known as Zante, is in an indentation in the SW coastline, not quite a bay, at about the island's closest point to the mainland of the Peloponnese, 18 km away. This town of 11,000 hugs a boomerang-shaped section of the coast, with a triangle-shaped main harbor, just south of which is a much smaller marina for private craft which shares a common mole with the main harbor. The waterfront is dominated by the mustard-colored bell tower of Saint Dionysios Church near the left, or south end. Although many of the town's neo-classical buildings were ruined by the '53 quake, the town was purposely rebuilt to reflect its old architectural character. The Square is the focal point of the city 24 hours a day, lined cheek-by-jowl with shops, cafes, and restaurants. Commanding the heights above the town are the wooded slopes of Bohali Hill, crowned by the remains of the Venetian Castle, and providing a beautiful panorama of the town, the surrounding area, the sea, and the steep hills above the suburb of Argassi, 6 km to the southeast, and further, to the headlands of the Peloponnese 20 km distant. It was on these heights where Dionysios Solomos composed the Hymn to Freedom. As a place visit in its own right, and as a base to explore the further reaches of the island, or to take day trips to beaches via local busses, you could do a lot worse than to stay in Zante.